AMMAN - Jordan and Russia have agreed to coordinate their military actions on Syria by setting up a "special working mechanism" in Amman, according to senior officials from the two countries. "The military coordination mechanism between Jordan and Russia concerns southern Syria and aims to ensure security of the Kingdom's northern frontiers," Minister of State for Media Affairs and Communications Mohammad Momani said. Momani said coordination between the two countries is not new as it takes place at all levels. "Jordan remains an active member of the international coalition fighting Da'esh terror group," the minister told The Jordan Times Friday. This statement was echoed the same day by Russian Foreign Minister Sergei Lavrov in Vienna. 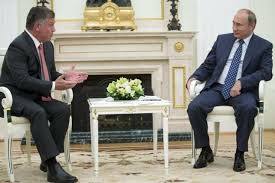 So Moscow's deal with Jordan could mark a shift in the alliances engaged in the Syria conflict, according to a dispatch by Reuters news agency from Moscow.